SKF NOTE: I’ve posted on this blog published and unpublished parts from this 1985 interview with Ed Soph. As I said in one post of interviewing Ed Soph twice: Ed was smart, funny, curious, methodical. He was a wonderful person to interview. No matter what question I asked, Ed had a thoughtful answer. I think all music teachers, not just drum teachers, can gain valuable insights from this interview. The last time I was in England, I ran into this little 12- or 13-year-old kid named Mark Mandaceer, who comes from one of those ghettos where they stick the West Indian folk. He’s so poor that he doesn’t even own a drumset. He can’t afford a teacher. He knows other kids who are taking lessons, and he cops lesson sheets from them. Man, this kid is just going to tear it up. He and the instrument are the same. He has natural movements behind the instrument, and the most beautiful thing of all is that he has no fear of failure — no fear of making a mistake. When he’s playing in this combo, and he tries to pull something off, but he drops about six beats all over the floor, he just turns to me and gives his great big smile, shrugs his shoulder and says, ‘Next time.’ The next time comes and he kills. Well, “Mark Mandaceer” should be “Mark Mondasir.” However, when Ed predicted “this kid is just going to tear it up,” he was spot on. 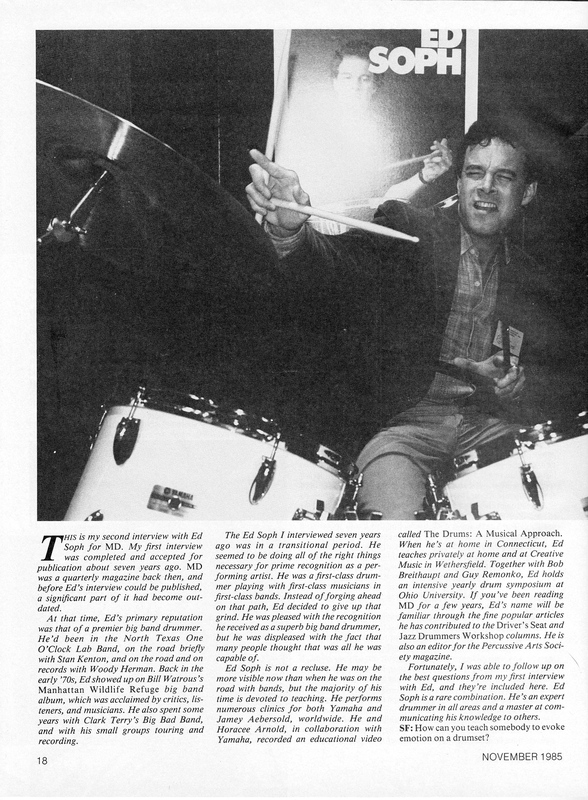 This entry was posted in SKF Blog and tagged Ed Soph, Modern Drummer, Scott K Fish. Bookmark the permalink.